BAGHDAD, Iraq (CNN) -- At least 100 British troops are likely to return to Iraq, a few months after the country withdrew its service members from their bases in and around the southern city of Basra. 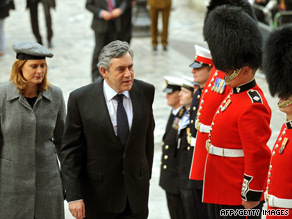 UK Prime Minister Gordon Brown and wife Sarah arrive for service marking end of combat operations in Iraq at St. Paul's Cathedral in London last week. Two Iraqi lawmakers and the British ambassador to Iraq said that Iraq's parliament, the Council of Representatives, approved a security pact with Britain that would allow at least 100 British troops to provide protection for oil sites and train Iraqi security forces. Iraq's presidency council -- made up of the nation's president and two vice presidents -- must sign off on the agreement. "We welcome today's decision," said Ambassador Christopher Prentice. "The agreement is evidence of our mutual commitment to building the capability of the Iraqi Navy to undertake protection of Iraqi territorial waters and installations." The accord stems from an Iraqi-British decision earlier this year to widen their relationship in many areas -- such as "economic, commercial, development, defense, cultural and educational relations," Prentice said. Almost all British troops in Iraq were pulled out this summer when the agreement that allowed them to be there expired. Only about a dozen remained to help train Iraqi police, but they operated under the command of NATO, not Britain. About 46,000 British troops were in and around Iraq at the peak of major combat operations in March and April 2003, according to the Ministry of Defence. That number was second only to the U.S. contingent in the country. The decision to allow UK forces to return came as families of British servicemen killed in Iraq told members of an official inquiry into the conflict that former Prime Minister Tony Blair must be held accountable for taking his country to war. Many blamed Blair for the deaths of their loved ones in an "illegal" conflict, and some called for him to be prosecuted for war crimes. The inquiry has yet to hear from witnesses, but on Tuesday it held the first meeting for bereaved families and Iraq veterans to decide its remit. Among those attending the session in London was Deirdre Gover, 63, whose son, Flight Lieutenant Kristian Gover, 30, was killed in a helicopter accident in Basra, southern Iraq, in July 2004. Later, she accused Blair of lying to the Cabinet and to the country in the lead-up to the war. "I hold Tony Blair personally responsible for the death of my son," she told the Press Association. "My son as an officer was prepared to die for his Queen and country in a just conflict. This was totally unjustified and wrong, and I think that's what the inquiry will prove."